Weighs loads on the spot. UL-approved scale operates on 6 D-cell batteries and weighs in pounds or ounces. Scale can also be calibrated for varying altitudes. 5,000-lb. capacity. Other features include: 205° turning radius, polyurethane load and steering wheels, and 3-position raise, lower, neutral hand control. Rebuildable overload bypass pump with one-year warranty. Fork height is 2.9" low to 8" high. 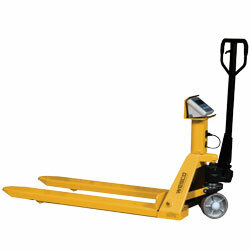 SPECIFY FORK SIZE: A - 22"W x 47-1/2"L, B - 27-1/2"W x 47-1/2"L. IN STOCK.